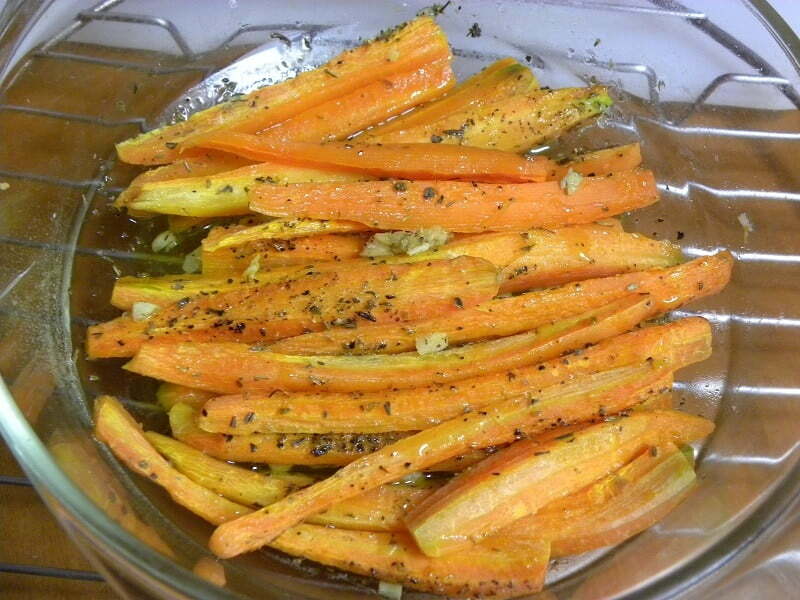 A simple recipe for Roasted Carrots with garlic and herbs, which makes a wonderful side dish to serve with meat or fish or combine them with other ingredients in a salad. When baked, they caramelised and I loved the way those aromatic herbs and the lemon juice balanced the sweetness of the carrots. I’ve done these carrots many times either baking them in the oven or cooking them in the microwave. I am not a fan of the microwave oven for cooking but if you are in a hurry, you do save some time. I have used them as a side dish to fish and meat but also used them in a chicken salad, which hopefully both recipes will be posted soon. The time of cooking will depend on the size of the carrot slices. Try them and you will be amazed how delicious roasted carrots could be! Peel the carrots and cut the top side. Cut each in half lengthwise and then cut again to get 4 sticks. (If they are very big cut them into six slices). Make sure all pieces are approximately the same size to ensure even cooking. Put the carrots in a bowl with the remaining ingredients and toss them well. Preheat your over to 180oC / 350o F.
Put them in a Pyrex or on a baking tin lined with parchment paper in one layer and bake for 25 minutes. Check if they are done and if you prefer them more tender bake for ten more minutes. Put them in a microwave safe dish or container together with the chopped garlic, olive oil, salt, pepper, thyme, oregano and lemon juice and mix them well. Cook for 8 minutes on medium heat (640 watt) with the grill and microwave on. Test for doneness and if you want them softer, add 2 – 3 more minutes, or until tender and crisp. Cook for 8 minutes on medium heat (640 watt) with the grill and microwave on. Test for doneness and if you want them softer, add 2 - 3 more minutes, or until tender and crisp. The time given above is for roasting them in the oven. In the microwave the time is about 8 minutes. It is preferable that the carrots stay al dente, firm and not overcooked. However, this is a matter of personal taste. I usually just use oven to make roasted carrots….definitely must try the microwave method. That fish was so perfectly done, Ivy. I am not a big fan of eating carrots. How ever these look very nice indeed. I think spreading a little bit honey over the carrots would give them a great taste. Great post! i just love carrot and this recipe look delicious. I am gonna try, thanks for sharing it.